Review copy snagged from the ARC pile at work. Eggbert is the youngest child of a farmer who lives on Deadweather island. It’s not a very nice place, Deadweather, and Eggbert’s family (especially his siblings) are not very nice people. It’s a bit cartoonish how awful they are: his brother, Adonis, beats on him continuously, and his sister, Venus, is always picking on him. His father, for whatever reason, doesn’t interfere, instead adding injury to insult with frequent whippings. Needless to say: Egbert is not an especially happy 13-year-old, but he has his books (that his slacker tutor has brought) and that helps. Then one day, his Dad comes back with some parchment and says they’re setting off for Deadweather’s sister island, Sunrise, which is a rare treat. Once there, they meet Mr. Pembroke, who, for reasons unknown, is being really nice to the family. He takes them back to his mansion, and offers them a hot air balloon ride… Egg gets out, mostly because he’s infatuated with Millicent Pembroke, and voila! Egg’s barbaric family is gone. For a while, living with the Pembroke’s seems like a dream: they’re nice, they feed him, he has access to the library, Millicent is charming… but then everything turns sinister and sour. Egg, after someone tries to kill him, is forced to run for his life. He smuggles away on a pirate ship, and finds that things at the ol’ hometsead aren’t all roses either. So, he does what any 13-year-old would do: he makes a stand. Sure, this is all a little (!) far-fetched, but I enjoyed it anyway. Think of it as Pirates of the Carribean with a 13-year-old Will Turner. There’s a Jack Sparrow character in Egg’s friend Guts, and Millicent could be Elizabeth Swan. It all works out. And it’s got the pacing, humor, and adventure elements that kids (well, and I) have come to expect from pirate stories. Plus, even though they’re pirates, they’re not cretins: some of the most trustworthy characters in this world are pirates. On top of all that, Rodkey does a great job of wrapping things up in this installment while setting up the Next Big Adventure. And since Egg and Guts are quite enjoyable characters to adventure with, I’ll be sure to check on them when they go on their next one. Great book, I recommend it to people who love reading a story with adventure and action. Egg lives on a plantation in Dead Weather with his horrid family, Venus, Adonnis, and his father who doesn't care a thing about Egg. Egg travels to Sunrise, meets new friends, nearly gets killed several times, and finds something that he didn't expect to be on a rotten plantation on Dead Weather. I enjoyed this book because the story was action packed and filled with adventure. 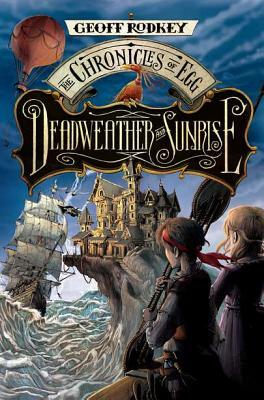 This was a great book and I hope you enjoyed/enjoy Dead Weather and Sunrise by Geoff Rodkey.